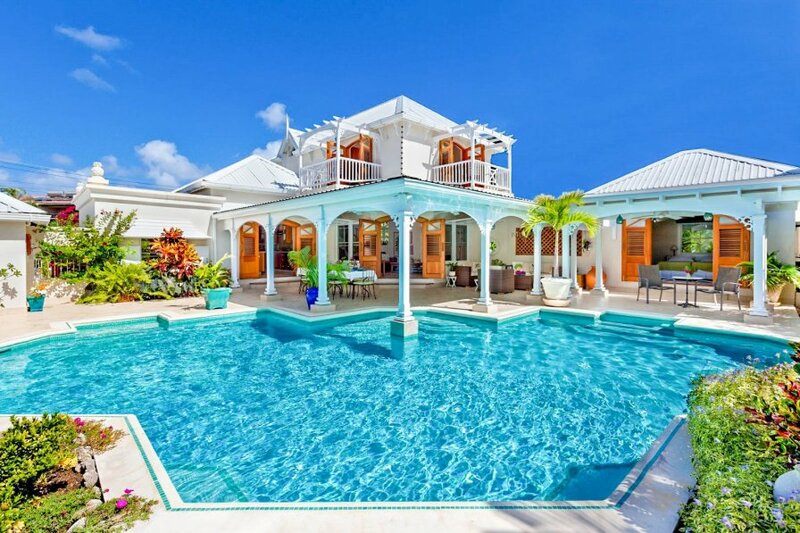 Villa Gibbes is a grand and tropical typical Caribbean designed villa with lovely flourishing gardens, a large glistening free-form swimming pool and captivating coastal views. Boasting lovely and dynamic architecture before you've even stepped inside, this holiday home dazzles with a bright white exterior complemented by light brown doors. The front of the villa is beautifully gated with palm trees and exotic bright flowers making for pleasant surroundings. At the back of the home, guests will discover a sizeable covered terrace which is home to a dining area with an elegant glass dining table, magnificently enhanced by flowers. The terrace also has a seating and lounging area, which is perfect for indulging in snacks and drinks while unwinding. The inside living areas contain high ceilings which make for ample living space and boast a clean and fresh aesthetic. The kitchen is contemporary with rustic wooden touches and incorporates a large fridge and an island in its centre that's great for socialising whilst preparing food. The kitchen also has a door which leads directly out onto the garden. The detached holiday villa is set over two storeys and has two bedrooms on the ground floor, with the master suite spread over the entirety of the first floor. The bright and spacious bedrooms are bursting with tropical flair and hold enough space to really unwind before bedtime. The villa contains a small study or working area with books, a desk and a computer where you can catch up on work from home or simply use to organise your days in Barbados. Villa Gibbes is a 3-bedroom villa, which sleeps up to 6-guests. The villa's outstanding feature is its unique private swimming pool…you're unlikely to have experienced anything quite like it! The holiday villa is just a 10-minute walk to the relaxing and serene Gibbs beach which features white sand and calm water - great for unwinding during the day. The beach is extremely quiet and offers plenty of shade for when the sun gets too hot. Little Switzerland is half an hour drive away from the villa. This is the place to purchase luxury and duty-free watches and jewellery on the island. With some great deals and brands including Omega, Pandora and Michael Kors. Little Switzerland has been running for over 60 years and provides the ideal gift for a loved one or treat for yourself. Offering fantastic customer service, staff will be on hand to help you to choose something special from some of the finest jewellery in Barbados. Red Clay Pottery in Bridgetown is only half an hour away by car. Here, you will witness how pottery is traditionally created as well as seeing the wonderful finished products on display. From display plates to refrigerator magnets, the pieces are as gorgeous as they are practical, made using the island's natural resources.